Several World Cup teams have now announced their preliminary World Cup squads, and with the tournament kicking off in less than a month it is time to look ahead to the group stage of the tournament. 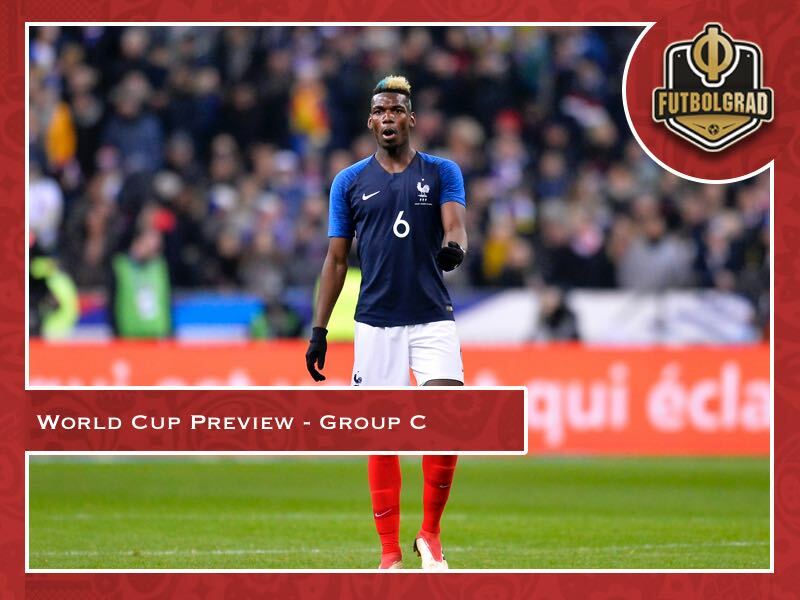 Up next is our World Cup Group C preview. France will be among the favourites heading into the World Cup after finishing the UEFA qualification Group A in first place ahead of Sweden, Netherlands, Bulgaria, Luxembourg and Belarus. Although impressive at times during World Cup qualification France’s brilliant results against the Netherlands (0-1, 0-4) are overshadowed by stumbles against Belarus (0-0), Luxembourg (0-0) and Sweden (1-2). Hence, although head coach Didier Deschamps had the privilege of leaving out big-name players like Bayern’s Kingsley Coman or Manchester United’s Anthony Martial due to France’s incredible depth, which is on the same level as World Cup favourites Germany and Spain, doubts remain on whether France are ultimately a World Cup favourite. Finally, there is no doubt that France have among the most talented sides going into the World Cup. But many experts doubt that head coach Deschamps has the tactical genius to get his side over the finishing line. France manifested those doubts at the 2016 European Championships were Les Bleus failed to win the title against a severely limited Portugal side. Furthermore, France’s national team benefited from individual mistakes in the semi-final against Germany and has since shown moments of brilliance – see the 4-0 victory against the Netherlands last fall – and acts of complacency – see the 0-0 draw against Luxembourg just a few days after the Netherlands result. The World Cup in Russia will, therefore, be also the ultimate test for Didier Deschamps. The question will be can the 49-year-old lead his country to a title? Is he capable of unifying a side that on paper belongs among the best in the world? Only results in Russia will give us the ultimate answer to those questions. France’s side includes several top stars, but Manchester United’s Paul Pogba and Atlético Madrid’s Antoine Griezmann will carry the majority of the responsibility. Both players have a point to prove as well. Pogba disappointed at times for United this season and will want to highlight that he is worth the exuberant amount of money spent on him. Griezmann, in the meantime, has been linked with a move away from Atlético and, as a result, will want to use the World Cup to underline his values. Other players to watch include Marseille’s Florian Thauvin, Lyon’s Nabil Fékir and Monaco’s Thomas Lemar not to forget Paris St-Germain’s Kylian Mbappé. Australia return to Russia after having represented the Asian Football Confederation at the 2017 FIFA Confederations Cup. Placed in a group with Germany, Chile and Cameroon the Socceroos were eliminated at the group stages of the tournament. Following the Confederations Cup Australia also somewhat struggled at the qualification stage of the 2018 FIFA World Cup. After finishing first in Group B in the second round of AFC qualifying, Australia finished just third in Group B during the third stage of AFC qualifying – behind Japan and Saudi Arabia. As a result, the Socceroos had to go through the elimination stage of World Cup qualifying and ultimately reached Russia after eliminating Syria in the fourth round and then Honduras in the intercontinental playoffs. When the dust settled head coach Ange Postecoglou had left the position as Australia’s head coach and was replaced with the Dutch coach Bert van Marwijk. Australia have qualified for the last three World Cups but never got past the round of 16 stage. Van Marwijk is now tasked to improve Australia’s result but placed in Group C with France, Peru and Denmark getting past the group stage could be considered a minor miracle. Australia’s squad lacks true star power. Bundesliga fans may remember goalkeeper Mitch Langerak, who played for both Borussia Dortmund and VfB Stuttgart. Avid followers of the Bundesliga will also recognise Mathew Leckie. The Hertha Berlin forward had a solid season for the club from the German capital scored five goals and one assist in 26 Bundesliga games this season. Premier League fans, in the meantime, will remember Tim Cahill. Now playing for Millwall in the Championship the 38-year-old is looking back at a career that included a successful stint at Everton and will in all likelihood play his last major tournament this summer. Peru are returning to the World Cup for the first time since 1982. Playing at the world’s biggest stage for the fifth time the Andes nation will look to improve on their quarterfinal result achieved at the 1970 FIFA World Cup in Mexico. Placed in Group C with France, Australia and Denmark Peru qualified for the tournament after finishing fifth in CONMEBOL qualifying and eliminating New Zealand in the intercontinental playoffs (0-2 on aggregate). South America is widely regarded as the most difficult place to qualify for a World Cup and Peru reached the playoffs after leaving highly-rated Chile in the dust. Coached by the 60-year-old Argentine Ricardo Gareca Peru managed some surprising results at the qualification stage beating Uruguay and collecting two draws against Argentina. La Blanquirrojaare the sort of side that places work ethics ahead of beautiful football – an ethos that has served them well throughout World Cup qualifying. It is also the sort of ethos that could surprise the more experienced sides like Denmark and Australia, and it would, therefore, be not a major shock if Peru reach the next stage of the tournament. Peru’s biggest star Paolo Guerrero will miss the tournament after being suspended for 14-months after testing positive for cocaine. Guerrero has been adamant that he has never consumed the drug and that his positive result has come from drinking contaminated tea. Furthermore, the forward has already served a six-month suspension, which was now extended just last week. Just weeks ahead of the tournament Guerrero was finally cleared to take part and together with Jefferson Farfán and Raúl Ruidiaz he will be the biggest star for the side. The former Schalke forward Farfán won the Russian Football Premier League with Lokomotiv this summer and has been a key player for his side all season. Ruidíaz, in the meantime, is among the best forwards in the emerging Liga MX. Playing for Monarcas, he could be among the players to watch this tournament. Denmark return to the World Cup for the first time since the 2010 FIFA World Cup in South Africa. Placed in Group C Denmark will now play their fifth tournament after finishing second behind Poland in the UEFA qualification Group E.
Leaving Montenegro, Romania, Armenia and Kazakhstan in the dust Denmark eliminated the Republic of Ireland in the playoffs (0-0, 5-1) to reach the 2018 FIFA World Cup. The 1992 European Champions will now look to build on their best quarterfinal finish – achieved at the 1998 FIFA World Cup in France – in this summer’s edition. Coached by the Norwegian Åge Hareide Denmark have a history of surprising at major tournaments. The question, however, remains whether the Scandinavian country has enough star power to qualify behind favourites France out of this group stage. The likely scenario will see Denmark battle Peru for second place in Group C.
Tottenham’s Christian Eriksen is Denmark’s biggest star. The attacking midfielder has been impressive for both Denmark and Hotspur all season. 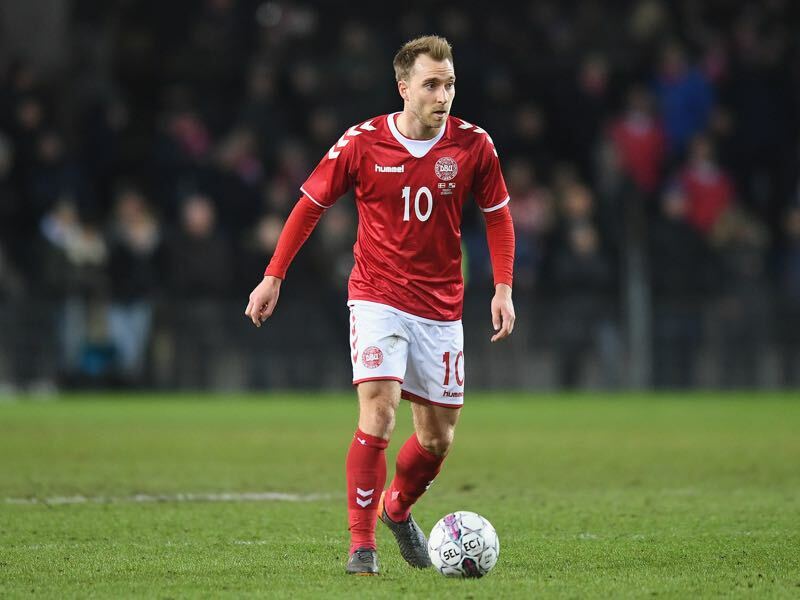 Scoring ten goals and 11 assists in 37 Premier League goals Eriksen has also scored eight goals and four assists in ten World Cup qualification matches for Denmark. Other Denmark players to watch include Leicester City keeper Kasper Schmeichel, Sevilla defender Simon Kjær and Rosenborg striker Nicklas Bendtner. Bendtner, in particular, seems to have resurrected his career in Norway where he has turned around his lifestyle and has emerged as a consistent goal scorer for Trondheim scoring 22 goals in 39 games throughout the 2017 and the still ongoing 2018 seasons. Another one to watch is Borussia Dortmund’s new signing Thomas Delaney.